Birthday parties are among the most important events in a child’s life! In Michigan, we’ve got plenty of amazing places to take children to make the most of their birthday, places that cater to all interests. Here are the 10 best! Novi's Paradise Park delivers celebration in just about any fashion you could ask for. Sure, there are bar and bat mitzvahs alike, as well as bachelor/bachelorette parties and even bridal and baby showers. But Paradise Park also has a well-known presence in kids' parties, voted “Best Amusement Facility” in the Novi area three times running by not only Channel 4 News, but also Novi Patch and the Novi News. With laser tag, go karts, a Euro Bungee dome, and a variety of other entertainments, there's plenty to be had here. Birthday party packages include homemade pizza, unlimited soda, a balloon bouquet and more. Head to East Lansing and check out Play for the kids' birthday, and you'll get an eyeful of a bizarre but brilliant experience. Play is a kind of indoor playground, which makes some sense—great regardless of time of year, so it's perfect for a kid's birthday party—but Play takes things up a notch with its “Imagination Playground,” a field featuring a host of moveable objects that can be used almost like life-size building blocks, a notion that most any kid would be happy with. Several locations in Michigan await those who go to Pump It Up, from Auburn Hills to Canton and a few others mainly in southeastern Michigan. Essentially a massive inflatable indoor playground, Pump It Up offers a variety of games and emplacements for the kids to enjoy. An inflatable birthday throne designates the birthday kid, and there are even some low-light activities that depend on the inflatables' glow-in-the-dark nature to fully provide. Once Upon a Princess brings together a set of actors, complete with high-end costuming, to create a complete princess-style experience for the birthday girl (or boy!). Songs, dancing, face painting, a complete “princess school” and more await, and the whole experience can even come to your house, with fees depending on distance from Kalamazoo. Koetsier's offers many of the common functions of a plant nursery and greenhouse operation, but will also include some noteworthy functions at various times of the year. A fall birthday party package includes hayrides, pumpkin painting and more as well as a birthday party hostess to keep everything moving smoothly. Featuring not only an indoor and outdoor water park known as Flash Flood, Full Blast also offers the Sports Forum, a wide array of recreational sports options ranging from basketball to softball, roller derby to floor hockey and beyond. If a complete water park and sports complex doesn't sound like an amazing idea for a kid's birthday, well, it's hard to imagine what would qualify. A private movie theater can be an amazing experience. It's not always easy to find naturally, but at Marquette Cinemas in Marquette it gets that much easier. Featuring not only a movie ticket, but also a private party room to decorate as you see fit—that's cleaned up afterward by Marquette Cinemas staff—as well as discounted concessions and a free movie poster for the birthday girl or boy, it's a complete experience. Traverse City once again delivers with its own Lucky Jack's, a magnificent indoor playground geared toward providing all those great kids' activities. 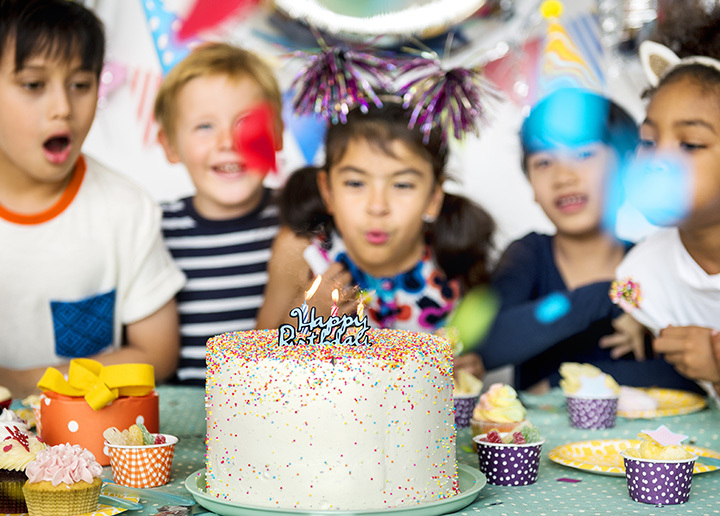 A Lucky Jack's birthday party includes an hour in a private party room—great for cake and snacks and such—followed by an hour of bowling, two slices of pizza and three pitchers of soda for $15 per guest. That's a great deal, but with billiards, an arcade and a variety of other attractions, Lucky Jack's will round out an afternoon like no tomorrow. If you've got a budding inventor, you might want to consider one of Ann Arbor's most unusual retail shops for a birthday party: Scrap Box. Scrap Box offers access to a range of recycled junk and factory end-runs with most items priced by the bagful. Featuring everything from wine corks to magnets and dice and beyond, birthday parties here tend to focus on arts and crafts on staggering scales. So for the kid who loves outsider art—and that's more kids than you might think—Scrap Box might be a once-in-a-lifetime wonderland. The zoo in general has been known to be a fine birthday party spot for animal enthusiast children, but the Saginaw Zoo in particular ratchets up the proceedings a bit with complete birthday party packages. Known as the Wild Time Birthday Party package, those who buy in get the party space at the children's zoo for up to two hours, with larger event tents available for parties featuring more than 25 guests. Throw in a “zoo present” for the birthday child in question, unlimited carousel and train rides, a handful of hay to feed the denizens of the “barnyard” attraction and specifically-designed theme invitations and this package should deliver in a big way for the animal-loving kid.